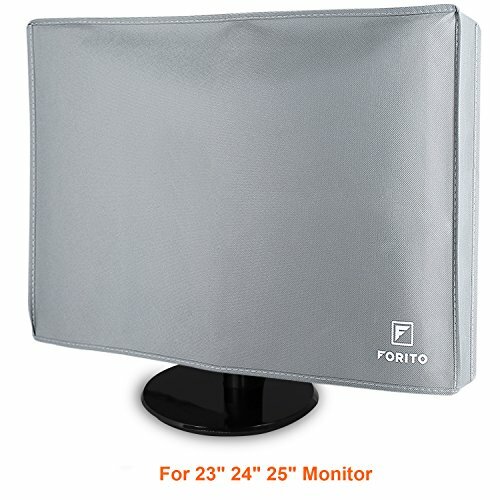 FORITO Computer Dust Cover Antistatic Non-woven Computer Dust Cover for 23” 24” 25” LCD/LED Screen Panel - Gray | Replicafer Co.
FORITO Monitor Dust Cover is a full protection solution for your computer monitors and screens. It is especially designed to protect your monitor from dust, dirt, fingerprints, oil and scratches when daily use. being stored, moving or traveling with you for work or vacation. 1. The monitor dust cover is compatible with the most desktop and computer monitor brands, includes Asus, Dell, HP, Acer, Samsung, LG, Viewsonic, AOC, Lenovo, BenQ etc. 2. We have different sizes to fit monitor screen from 20" to 34". Please measure your monitor from top to bottom and side to side in inches and select a appropriate size product. Fit for most of 23" to 25" LCD/LED monitors, dimensions: 24W x 18H x 3D. (Kindly note: monitor size is display's diagonal size, not the width) -!!! If there is any doubt, compare your monitor size with image 2 before buying. Fit for mostly of 23" to 25" LCD/LED monitors screens, dimensions: 24W x 18H x 3D. (Kindly note: monitor size is display's diagonal size, not the width) -!!! If there is any doubt, compare your monitor size with image 2 before buying.